Cryptocurrencies are on the rise right now. BitCoin is becoming more popular by the hour and other currencies are being created all the time. People are investing pretty good amounts of money in them and that means it’s high time to start a business to take advantage of it. Or maybe you already own such a business? In any case, today we have collected 15 Premium WordPress Templates designed for websites that fill the cryptocurrency niche. Crypton is the biggest multipurpose cryptocurrency WP theme perfect for any website that touches upon this topic. It features LearnPress, Cryptocurrency Payments Donations, Crypto Price Calculator, Cryptocurrency Calculator, an Online Wallet Registration System, Cryptocurrency All-in-One Plugin, Exchange Rates and the LMS plugin. The ThemeRex donations plugin is also included in the bundle in case you wish to receive payments or donations online. Bitunit is a functional and professionally-crafted WordPress template that will become the perfect starting point of cryptocurrency blogs and virtual currency sites. The fully adaptive layout of its pages will display all pieces of content perfectly well on both smaller and larger screens. The theme is integrated with Elementor page builder, which allows you to create versatile web pages as you simply drag and drop widgets and pre-designed elements of the theme. Intended for the quicker and worry-free site development, Bitunit also contains pre-designed header and footer layouts, as well as ready-made pages suited for different purposes. The theme is fully editable. It contains the premium-quality Jetelements pack, which is already included in the cost of the theme. Free images, detailed documentation, and free 24/7 support are bundled also. Kryptex is compatible with the Cryptocurrency All-in-One plugin, which will allow you to display prices, exchange rates, charts, a calculator and even receive payments and donations. The theme is also integrated with WooCommerce in case you wish to sell mining equipment online. It is also fully responsive, Retina- ready and SEO- optimized. Cryptic’s sleek design will add quite some character to your website in combination with the amount of feature the theme boasts. It comes with Visual Composer, Revolution Slider and ever Video and Parallax backgrounds. 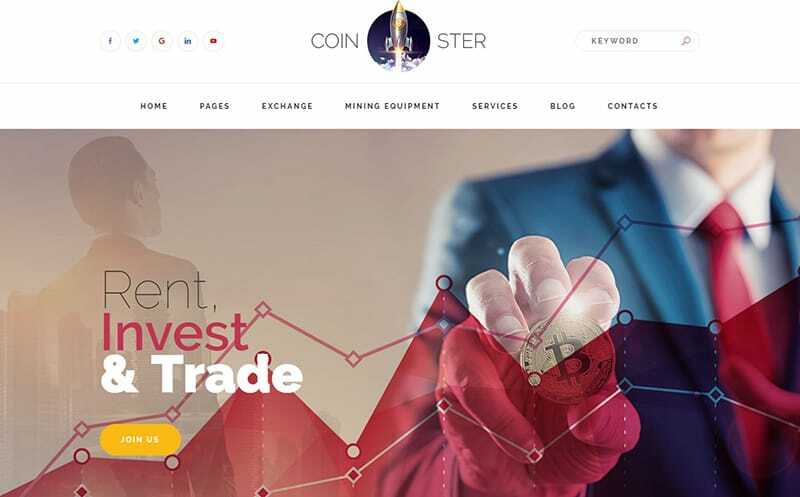 The template is also packed with all sorts of converters, tickers, statistics, live price updates and even a White Paper page that you can use for your ICO. Crypterio is supplied with everything you need to build a successful Cryptocurrency website. It comes with a set of Virtual Coin widgets, a Coin Exchange Calculator, Revolution Slider, Visual Composer, WooCommerce compatibility and a few different page templates. The design is fully responsive, crossbrowser compatible and even supports parallax and video backgrounds. Ivetex was designed for companies who provide business, investment and tax assistance to both corporate and individual clients. But its elegant and stylish design is very multipurpose and suitable for basically any business website. It is packed with Visual Composer, Media Content Manager, Shortcode Builder, a set of Blog styles and even WooCommerce Compatibility. Coinster features a drag & drop Unyson Page Builder which lets you customize your pages without ever touching a line of code. It is also integrated with popular plugins like MailChimp, Contact Form 7, AccessPress and WooCommerce.The theme comes with Light and Dark skins, Boxed and Wide layouts, the Snazzy Maps plugin as well as a pack of custom widgets. Bryte is a multipurpose business template and comes with 7 unique skins, 7 home pages, 4 blog layouts, 7 header and 3 footer styles. It comes with the Elementor Page Builder, Revolution Slider and the JetElements plugin for absolutely free. It is also fully responsive, Retina ready and compatible with WooCommerce in case you wish to use your website as a platform to sell goods. Beratung is another powerful multipurpose theme suitable for most businesses out there. It includes the Revolution Slider and Visual Composer plugins, saving you $34 and is compatible with WPML, Yoast, W3TC, Contact Form 7, JetPack Gravity Forms, Revolution Slider, Layer Slider, WooCommerce, All-in-One SEO and more. The template is child theme compatible, SEO optimized and translation ready. Investment Expert is a light and clean solution for all your business needs. It features multiple Home page styles, 5 different header variations, Wide and Boxed layout versions, unlimited color options, Visual Composer, Revolution Slider and WooCommerce. It also supports WPML, PolyLang and Multilanguage by BestWebSoft plugins to make your website accessible to anybody. As the name suggests, this template was designed for companies who provide consulting, investment advising and other similar types of services. It is supplied with a collection of powerful shortcodes and widgets as well as support for such popular plugins as Visual Composer, Revolution Slider, Booked Appointments, Essential Grid, MailChimp, Contact Form 7 and others. The template is optimized for performance and is fully responsive and crossbrowser compatible. Antverp is a great choice for those who provide insurance services, business consulting or tax assistance, but the design is so versatile that it can be used for whatever business niche you wish. It comes with Visual Composer support which allows you to create any type of layout. A number of blog styles let you present your business in an attractive manner. The theme is also SEO optimized and fully responsive, which is also an important factor in the success of a modern website. Revirta is a perfect choice for both small and large-scale businesses. It is integrated with the ThemeRex Addons plugin, which adds 12 new widgets, CV Card functionality, image optimization options and much more. The theme is fully responsive and Retina ready, which will make your website accessible from every device out there. LeGrand’s professional design will help you win over your potential customers’ trust. It is packed with multiple Blog styles, custom shortcodes and widget sets as well as support for Visual Composer, Smart Slider 3 Lite, WP Bakery Page Builder, Contact Form 7, Essential Grid, MailChimp for WP, Instagram Feed and ThemeRex Addons. The theme even comes with the one-click demo content installation option. This extremely versatile and highly functional theme comes with tons of pre-built pages and other elements needed to build a successful financial website. It features Visual Composer, Revolution Slider as its home slider, Essential grid in case you wish to create galleries to show off your content as well as lots of custom widgets and shortcodes. It is also compatible with Mega Menu, a plugin that lets you create all kinds of menus of varying complexity to help your visitors navigate your pages. Morrison Invest features powerful shortcodes, custom widgets and an incredible range of customization options. It is compatible with such plugins as Revolution Slider, Essential Grid, PO Composer and Visual Composer for you to create the website of your dreams. It is also fully responsive, Retina and Translation ready and SEO optimized, making your website accessible to anyone, anywhere in the world no matter their language or device. As you might have guessed, premium templates are not free. Why would you buy something when you can find a free version of the same thing? The answer is simple. If you want a quality product, you either have to buy it or create it yourself. You could create a completely new template from scratch, but that would take you lots of time, patience, and most importantly, coding knowledge. Or, you could buy a professionally-crafted template that comes with 24/7 support if you ever have any questions or run into any difficulties. Our services are here to save you both time and nerve. All of the themes we present to you today have been created for WordPress. It’s a content management system perfect for creating any types of websites. It is one of the most popular pieces of such software, too. Nearly every 4th website on the entire Internet is powered by it. The reason for such popularity is the fact that the system is free and open-source, which makes it available to absolutely anyone. It is also very user-friendly and flexible, so it’s a good choice for both rookie coders and seasoned professionals. There’s basically nothing WordPress can’t do with its thousands of plugins and open-source nature. But enough wasting your time with walls of text. You came here for the templates, and we all know it. So, go ahead and check them out! We hope you’ll find something that appeals to your taste. And be sure to leave all the feedback you have in the comment section, as it always helps us improve!